On September 4, 2005, Kyle Busch won his first ever Monster Energy NASCAR Cup Series race in the Sony HD 500 at Auto Club Speedway. Coincidentally, it was first race I ever watched when I discovered NASCAR through my then day job in advertising (which is a whole other story). 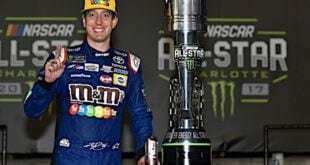 This Sunday afternoon (March 17) at the very same venue, Busch might just pick up a very significant milestone victory – his 200th across all three of NASCAR’s major series. 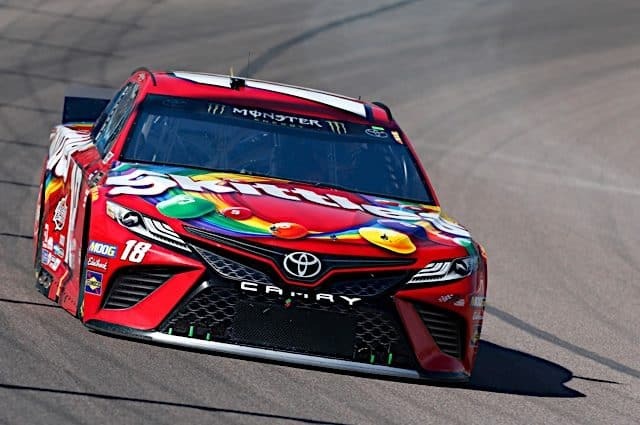 “It’s not for me to worry about it’s for everyone else to discuss about and talk about and argue over and debate,” Busch told FOX’s Jamie Little in the post-race interview upon completion of a stylish burnout on Sunday (March 10) at ISM Raceway. And he’s right. All he can do is tick off the wins. Let the conversation land where it may. For me, it’s a discussion absolutely not worth having. The two records (once Kyle picks up that one more victory) are simply not comparable. They are achieved in different eras with different equipment, different rules and different levels of competition. If there is a record in NASCAR that will never be broken it’s the King’s 200 Cup wins and whatever number Busch ultimately ends up with, Petty’s Cup win total will stand (rightfully) alone. But in the context of the history of NASCAR, Busch’s achievement also stands on its own merits – a testament to his dedication, commitment and sheer will to win whatever he wheels (and yes, even in races where he’s in the best stuff). All told, Busch has a remarkable 20 percent win rate (199 wins, 996 total races). And however, you might want to dismiss the second and third series victories, there’s no question that winning one in every five races is a sign of ridiculous talent. How often have we seen a race when the best driver doesn’t win? Kevin Harvick, a legend of the sport, has likely left double digit wins on the table in this regard which goes to show how hard it is to win, period. A couple of weeks ago, I wrote about the lofty place the Busch brothers have in the history of the sport, but when it’s all said and done Kyle will be considered the most successful of the two by quite a distance. When he hits the 200-win mark either this coming weekend or at some point in the next month, the conversation will reach a new decibel level. One of my favorite things in all of NASCAR is a second-place interview with Kyle Busch. 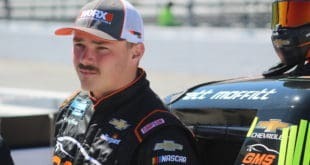 While it’s fair to say all the top echelon NASCAR drivers are fierce competitors, no one manages to look more disappointed and disgruntled with the position of first loser than Kyle. Some will criticize him for this but I would not be one of them. I love the passion. Could he disguise it a little? Certainly. But then it wouldn’t be who he is. Put another way, does anyone show they hate losing more? And that, in part, is what makes him so great – a sure fire first ballot Hall of Famer. Can’t we just enjoy Kyle’s incredible achievement for what it is rather than trying to demean it by a comparison to Richard Petty who is and always will be the King? Team Penske’s Josef Newgarden picked up a season-opening victory in the NTT IndyCar Series on the streets of St. Petersburg, the 11th victory of his eight-year, 118-race open wheel career. For Newgarden, it was a good first step in his season long quest to win another championship to go with the one he secured in 2017. Last season, Newgarden won three races, four poles, led 485 laps led – the most in the series by some 70 laps – and had an average finish of 7.1, good enough for a fifth-place finish in the overall standings. Defending champ, Scott Dixon, finished second at St Pete’s, and you can be pretty sure that by the time we come to decide the season at Laguna Seca, he’ll be very much in the mix for yet another title. And on the one hand, he’s absolutely right. Looking forward to the next race is where we need to be. Here’s hoping this issue is a one-off aberration and not a sign of things to come. There’s too much good going on in IndyCar for situations like the one we saw occur on Sunday. This Sunday marks the opening of the 70th season of the Formula One World Championship. We start the season, for the 22nd time, in Melbourne, Australia at the Albert Park Grand Prix Circuit and finish on December 1 in Abu Dhabi at the Yas Marina Circuit after 21 races spanning five continents. Lewis Hamilton is defending champion, having won two titles in a row and four times in the last five years. The British veteran is looking for a hat-trick of titles and his sixth overall F1 championship. Sebastien Vettel will, once again, be Hamilton’s main rival and based on what we’ve seen in pre-season testing (not always a totally reliable indicator), Vettel’s Ferrari will be the car to beat. It all begins again this Sunday. I, for one, can’t wait. One quick final note on F1, if you get a chance check out the recently released “Formula 1: Drive to Survive” series on Netflix which looks at stories from the 2018 season. It’s really, really good. For the fifth race of this nascent season, we head to the wide-open spaces of Auto Club Speedway in Fontana, California. This will be the 30th visit to the 2-mile, D-shaped, low-banked oval, a streak that runs all the way back to 1997 and a race won by none other than Jeff Gordon. You’ll be unsurprised to learn that Jimmie Johnson has the most wins among active drivers with six, with the aforementioned Kyle Busch in second place with three wins. Brad Keselowski, Martin Truex Jr., Kyle Larson, Kurt Busch and Kevin Harvick all have a win apiece. Truex won this race a year ago in dominant fashion, the first of four victories on the way to a second-place finish overall in the standings. Truex won last years race by 11.6 seconds, the widest margin of victory all season. He would take the same again this Sunday, no question. Here’s hoping it’s a great race this weekend. 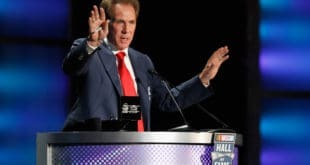 A quick point to finish with this week, since I’ve exceeded my word count for sure, on the 2020 NASCAR schedule which is due to be unveiled at the start of April. Now it’s fair to say, there are plenty of folks who will be very interested in how different this might look from the schedule we’ve grown used to with a few minor changes here and there. And I hope something different is what we see. We need revolution not evolution here, and it’s the perfect chance to make some bold moves. Fingers very tightly crossed on this topic, that’s for sure. Tags Josef Newgarden Kyle Busch Lewis Hamilton Martin Truex Jr.
200 is great …but I kinda look at it as Kyle is in High School racing against middle school on Saturdays and elementary on Friday nights. Kyle has won 2 in TEN races in THREE series. Petty and Pearson won 2 in 11 in ONE! CUP! Nowhere close to the same. Kyle is close to 2 in TWENTY in Cup. 52 wins in 502 events isn’t close to 105 wins in 574. And Pearson has 113 poles. Kyle has 31. How many times has Kyle had to show up at Bowman-Gray on a Tuesday or race in Toronto on Wednesday and Buffalo the next night? Or three races in a week in three states? Tiger Woods cherry picks his events too. 4, Clyde Lynn 5, John Sears 6, Elmo Langley 7, James Hylton 8, Jabe Thomas 9, Wendell Scott 10, Roy Tyner. And for the record points position drivers 4 thru 10 had a total of 5 wins. None in 1968 but FOR THEIR CAREERS! Richard Petty was one of my first National racing favorites and truly will always be the King. I want to take exception, however, with your remark in parenthesis inferring that Kyle Busch has accumulated a number of his victories in better equipment than his competition. The fact that the equipment was better may be true but, more accurately, is due to resources and talent and being better prepared. I would bet that you are too young and too British to have seen the assortment of crap wagons that made up the fields that PE competed against in the 60’s and early 70’s. Petty was about the only team that appeared at the 50 plus races that made up the schedule in those times. Superior equipment? I witnessed Richards first Daytona win in an ARCA car that was 10 mph faster than any car in the field. The car was so much faster than a young Petty that he had a hard time keeping it out of the fence every time he stuck his foot in it. I suspect I’m in the distinct minority but I’m a grey beard who thinks Kyle Busch is more talented than RP.